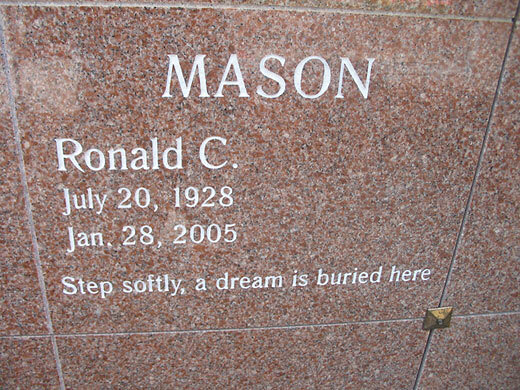 On Easter Saturday, March 27th, 2005, our father, Ronald Mason, was interred at Mount Pleasant Cemetery in Toronto. He now rests peacefully in the cemetery's Garden of Remembrance in a beautiful, green-filled, glass-roofed conservatory. View Photographs of the Memorial Service. View Poems Read During the Memorial Service. Our father left us eight weeks ago this weekend. If you have been a regular visitor to this website, you will know that his sudden death has not been easy on me or my siblings. On Easter Saturday, my mother Mary and my sister Lisa (and her children, Chantal and Jacob) joined me and my wife and young son at Mount Pleasant Cemetery in Toronto where we presided over the internment of my father's ashes. He now rests peacefully in the cemetery's Garden of Remembrance in a beautiful, green-filled, glass-roofed conservatory. I like to think that our father would have been very happy with his final home. Also this weekend, Louis and my sister Moya completed and posted on this site a slideshow in tribute to our father which contains 73 pictures of, or by, or relating to our father, set to a song entitled "Sand and Water". It is a special tribute to our father, one that was put together masterfully by Louis and Moya. We all thank them very sincerely for their efforts on this. And we cherish the pictures and music that celebrate our father's life and family at this continuing difficult time. Many of you are also probably aware that we were fortunate to have an article about my father published in the Globe & Mail on Friday (March 25) in the paper's famous Lives Lived section. So, with the completion of the internment and the video and the publication of the newspaper article, this weekend in some ways marked the climax of a two-month mourning period for our father that began on January 28 when he left us so suddenly in the heart of a very long winter. This weekend I assumed I would find some closure to my father's sudden death. Instead, I realize that my family and I are still struggling to accept his absence and likely miss him more than ever. It's easier to conceal or control our grief when we are busy making plans for burying or remembering the dead. Now that many of these tasks are completed, we have more time again to dwell on our father's sudden death and to feel saddened or depressed by his absence. As the youngest child (by many years) of Ron and Mary - the so-called "accidental son" - I did not know my father when he was young and healthy. Unfortunately, most of my immediate memories of my father are from the last few years after he had suffered a broken neck in an accidental fall. He was never the same after that and began a slow and steady decline. So I find it fascinating to read so much about my father's earlier, healthier and more enriching years. I'm surprised to see so many old photos of my father and the rest of my family, for the very first time. But as I learn more about who my Dad was, I realize I miss him more as a result. I now know that I'll never meet the young Ron Mason who was famous for his relentless energy and unrivalled skill on the dance floor. I know I'll never meet the art gallery owner who charmed artists and premiers alike in the 1970s. I know I'll never meet the determined father who brought his wife and kids on a magical driving tour of the United States in the summer of 1971 - a trip that will be cherished forever by my brother and sisters for its museum visits and roadside coleman stove meals. Fortunately, however, I did meet and remember the middle-aged father who took the time to teach his youngest son how to play a solid game of chess. I also remember the aging man who, despite a number of eye operations, could still teach his son a thing or two about playing snooker. And seeing so many pictures of my family from so many years ago makes me realize that I'll never know or remember my mother as a beautiful young woman with flaming red hair and funky green glasses and a mischievious smile. Neither will I ever know my brother and sisters when they were so young and care-free as they appear in the family photos of thirty years ago. So in saying goodbye to my Dad and, in the process, learning so much more about him, I am left with regret for having never known his younger, kinder, happier, healthier self. And in a way, I guess I'm now mourning for my whole family, for my father, for my mother, for my aging siblings, for my own spent youth and for perhaps an earlier simpler life that, in the end, is maybe more of an ideal than a memory.